The Historic Center of Macau (Portuguese: O Centro Histórico de Macau; Traditional Chinese: 澳門歷史城區) is a collection of more than twenty monuments and sites in Macao (also spelled Macau). Founded as a Portuguese trading port in the mid-sixteenth century, Macao has developed a continuous presence on mainland China, comparable to Hong Kong established by Great Britain, only 60 kilometers (37 mi) away. Portugal, Great Britain, Spain, Germany, France, and Holland all sought to open trade with China. Portugal arrived first on the scene among the European powers. Macao has many similarities with Goa in India. The presence of Portuguese Catholic Churches, forts, government buildings, and cultural centers are all present. In Macao, a unique dimension is presented. Over the nearly three hundred and fifty years of the Portuguese presence in Macao, until formally handed over to China in 1999, Portuguese Macauns lived in harmony with the Dutch, British, and Chinese. The legacy of intercultural integration reveals itself in the architecture of Macao and historical sites like the Protestant Cemetery and the A-Ma Temple which was built in the fifteenth century. The A-Ma Temple promotes a faith that combines Confucianism, Taoism, Buddhism and folk beliefs, and the Protestant missionaries promoted a brand of Christianity at odds with Roman Catholicism. China has proudly promoted Macao since taking possession in 1999, as a unique example of Chinese culture, an example that blends Chinese and Western culture harmoniously. This points especially to the cooperative relations between Portugal and China. In 2005, UNESCO designated the Historic Center of Macau a World Heritage Site, the 31st designated World Heritage site in China. The Ruins of St. Paul's (Portuguese: Ruínas de São Paulo) refers to the façade of the Cathedral of St. Paul, a seventeenth century Portuguese cathedral in Macau dedicated to Saint Paul the Apostle. The ruins constitute one of Macau's most famous landmarks. Built from 1582 to 1602, by the Jesuits, the cathedral constituted the largest Catholic church in Asia at the time, and the royalty of Europe vied with each other to bestow upon the cathedral the best gifts. With the decline in importance of Macau, overtaken as the main port for the Pearl River Delta by Hong Kong, the cathedral's fortunes similarly ebbed. A fire during a typhoon destroyed it in 1835. The Fortaleza do Monte overlooks the ruin. The ruins consist of the southern stone façade, intricately carved between 1620 and 1627, by Japanese Christians in exile from their homeland and local craftsmen under the direction of Italian Jesuit Carlo Spinola. The crypts of the Jesuits who established and maintained the Cathedral also remain. The façade sits on a small hill, with 66 stone steps leading up to it. The carvings include Jesuit images with Asian themes, such as a woman stepping on a seven-headed hydra, described in Chinese characters as "the Holy Mother tramples the heads of the dragon." A few of the other carvings include founders of the Jesuit Order, the conquest of death by Jesus, and at the top, a dove with wings outstretched. Resisting calls for demolition of the dangerously leaning structure, the Instituto Cultural de Macau excavated the ruins from 1990 to 1995, to study its historic past. They uncovered crypts and the foundations that revealed the architectural plan of the building. They discovered numerous religious artifacts found together with the relics of the Japanese Christian martyrs and the monastic clergy, including the founder of the Jesuit college in Macau, Father Alessandro Valignano. The Macanese government restored the ruins, turning the site into a museum. The facade has been buttressed with concrete and steel in a way which preserves the aesthetic integrity of the facade. A steel stairway allows tourists to climb to the top of the facade from the rear. People customarily throw coins into the top window of the ruins from the stairs for luck. 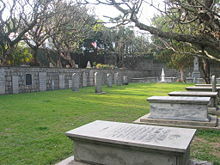 The British East India Company established the Old Protestant Cemetery (Traditional Chinese: 基督教墳場; Simplified Chinese: 基督教坟场), located close to the Casa Garden, in 1821, in Macau in response to a lack of burial sites for Protestants in the Roman Catholic Portuguese colony. The last resting place of the artist George Chinnery, missionaries Robert Morrison and Rev. Samuel Dyer, Royal Navy Captain Henry John Spencer-Churchill (son of the 5th Duke of Marlborough and great-great-grand-uncle of Winston Churchill) and U.S. Naval Lieutenant Joseph Harod Adams (grandson of the second president of the United States, John Adams, and nephew of the sixth, John Quincy Adams). The Portuguese Macau considered Roman Catholic ground sacred and authorities barred the burial of Protestants within its city walls. On the other side of the barrier gate, the Chinese proved equally intolerant of the burial of foreigners in its soil. That left the Protestant community of British, American, and Northern European traders with the only option of a secret night-time burial in the land between the city walls and the barrier gate. They risked confrontation with Chinese should they be discovered, or worse, desecration of the graves once they had gone. 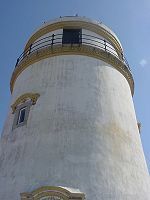 Lighthouse at the Guia Fortress. The matter finally found a resolution in 1821, after the death of Robert Morrison's wife, Mary. The local committee of the East India Company voted to purchase a plot of land, registering the property with the Portuguese to permit the burial of Protestants. The British East India Company opened the cemetery for the burial of all foreigners, moving several graves from other locations outside the city walls into the cemetery. That explains why some graves have dates before the founding of the cemetery in 1821. Britain, the United States of America, Holland, Denmark, Sweden, and Germany have nationals buried there. After the cemetery closed in 1858, it became known as the "Old" Protestant Cemetery. The Morrison Chapel, named in honor of Robert Morrison, adjoins the cemetery. The Guia Fortress (Portuguese: Fortaleza da Guia; Chinese: 東望洋炮台) is a historical military fort, chapel, and lighthouse complex. The fort and chapel had been constructed between 1622 and 1638, after an unsuccessful attempt by the Netherlands to capture Macau from Portugal. The lighthouse, constructed between 1864 and 1865, constitutes the first Western style lighthouse in East Asia or on the China coast. The lighthouse stands ninety one meters and casts a visible light for twenty miles in clear weather conditions. The complex, built upon the highest point on Macau, Guia Hill, received its name from the same location. In 1998, builders uncovered frescoes in the chapel during routine conservation work representing both Western and Chinese themes. A-Ma Temple (Portuguese: Templo de A-Má;Traditional Chinese: 媽閣廟; Simplified Chinese: 妈阁庙), constitutes one of the oldest and most famous temples in Macau. Built in 1488 C.E., the temple has been dedicated to the goddess of seafarers and fishermen Matsu. The name Macau may have derived from the temple. When Portuguese sailors landed at the coast just outside the temple, asking the name of the place, the natives replied "A-Ma-Gao" (Bay of A-Ma). 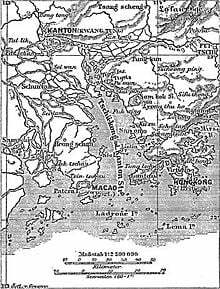 The Portuguese then named the peninsula Macau. Ancient Chinese texts describe the temple in precise detail, and paintings provide good depictions of the site. The temple had been one of the first scenes photographed in China. 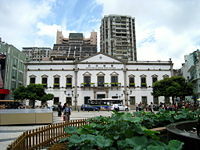 Dom Pedro V Theatre (Traditional Chinese: 伯多祿五世劇院), situated at Largo de Santo Agostinho, Macau, had been one of the first Western-style theaters in China. The theater constitutes an important landmark in the region and remains a venue for important public events and celebrations. Local Portuguese built the Dom Pedro V Theater in 1860, to commemorate their reigning king, Peter V. The theater, neo-classical in design, incorporated a portico front on a rectilinear plan. Sir Robert Ho Tung Library (Portuguese: Biblioteca Sir Robert Ho Tung; Traditional Chinese: 何東圖書館), a public library in Macau, sits in St. Augustine’s Square. The library has been housed in a mansion with historical, cultural and architectural value. Dona Carolina Cunha owned the building constructed before 1894. 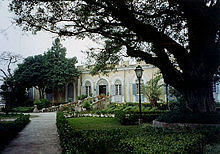 Hong Kong businessman Sir Robert Ho Tung purchased the mansion in 1918, as a retreat and he lived there between 1941 and 1945. His will bequeathed the building to the Government for conversion to a public library when he passed away in 1955. The Sir Robert Ho Tung Library formally opened, in 1958, to the general public. In 2005, the government constructed a new building near the back garden of the mansion, making the library the biggest public library in Macau. The Leal Senado, Portuguese for Loyal Senate, served as the seat of Macau's government (Legislative Assembly of Macau) during its time as a Portuguese colony. Located at one end of the Senado Square, the building had been constructed in 1784. Portugal's Prince-Regent João, who became King John VI of Portugal, bestowed the title on Macau's government, in 1810, as a reward for Macau's loyalty to Portugal during the Iberian Union between 1580 and 1640. After the handover of Macau to China in 1999, it became the headquarters of the Institute of Civic & Municipal Affairs (Portuguese: Instituto para os Assuntos Cívicos e Municipais). The Senado Square, or Senate Square (Portuguese: Largo do Senado; Traditional Chinese: 議事亭前地), designates a paved area in the center in Macau, enclosed by the building of the Leal Senado, the General Post Office, and St. Dominic’s Church. The square has been paved in traditional Portuguese paving. Holy House of Mercy (Portuguese: Santa Casa da Misericórdia; Traditional Chinese: 仁慈堂大樓), designates an historic white structure in Macau's Senado Square. Built in 1569, on the orders of the Bishop of Macao. The structure had served as a medical clinic and social welfare center in early Macau. It later served as an orphanage and refuge for widowers of sailors lost at sea. St. Dominic's Church (Portuguese: Igreja de São Domingos; Traditional Chinese: 玫瑰堂), a Catholic church in Macau, stands in the Largo de São Domingos near Leal Senado. Three Spanish Dominican priests built the church in 1587. The first Portuguese newspaper on Chinese soil, A Abelha da China (The China Bee), was published from the building in 1822. The Na Tcha Temple (Traditional Chinese: 大三巴哪吒廟), built in 1888, is a Buddhist and Taoist temple in Macau dedicated to the worship of the deity Na Tcha. The small traditional Chinese temple comprises a simple, single chamber building measuring 8.4 meters (28 ft) long and 4.51 meters (14.8 ft) wide. The entrance porch opens to the temple building measuring 5 meters (16 ft) in depth. The building, painted gray, has few ornaments except for paintings on walls under the entrance porch. The Na Tcha Temple, located behind the Ruins of St. Paul's, remains of a principal Jesuit cathedral in the region, serving as one of the best examples of Macau's multicultural identity. Fortaleza do Monte (Portuguese for Mount Fortress, also Monte Forte, officially Fortaleza de Nossa Senhora do Monte de São Paulo, in English: Fortress of Our Lady of the Mount of St. Paul; Chinese: 大炮台) is the historical military center of Macau. The fort had been built to protect the property of Jesuits in Macau in the sixteenth century. Later the Governor seized it for the defense of Macau. The Museum of Macau, built on the hill in the 1990s, has a tree-covered park at the top of the fort with a panoramic view of the Macau mainland. Casa Garden, a small park in Macau was built in 1770. The park had originally been the residence of a wealthy Portuguese merchant Manuel Pereira. The British East India Company rented it for use to house the directors of the Macau branch of the company. The park contains the old residence, Old Protestant Cemetery and an art gallery. The garden serves as the headquarters of the Macau delegation of the Orient Foundation. Inside the main entrance of Leal Senado, the title granted to Macau by King João IV is displayed. ↑ UNESCO, Advisory Body Evaluation. Retrieved September 13, 2008. ↑ UNESCO, UNESCO Nomination File. Retrieved September 13, 2008. ↑ Jo Allum, Sharon Leece, Christine Meaney, and Vivien Jones, Legends of the Dragon: Celebrating Asia's Historic Splendour (Hong Kong: PPP Co., 2006), 68. ↑ Lindsay Ride, May Ride, and Jason Wordie, The Voices of Macao Stones (Hong Kong: Hong Kong University Press, 1999), xviii. ↑ Christina Miu Bing Cheng, Macau: A Cultural Janus (Hong Kong: Hong Kong University, 1999), 93. ↑ Steven K. Bailey, Strolling in Macaul a Visitor's Guide to Macau, Taipa, and Coloane ([S.l. ]: Thingasian, 1999), 55. ↑ Lindsay Ride, May Ride, and Bernard Mellor, An East India Company Cemetery: Protestant Burials in Macao (Hong Kong: Hong Kong University Press, 1996), 275. ↑ Ride et. al., Macao Stones, 77. ↑ Philippe Pons and Sarah Adams, Macao Topographics (London: Reaktion, 2002), 73. ↑ www.66163.com, Hakka and Macau. Retrieved August 5, 2008. ↑ Pons and Adams, Macao, 45. ↑ Cesar Guillen-Nuñez and Ka Tai Leong, Macao Streets (Hong Kong: Oxford University Press, 1999), 17. Allum, Jo, Sharon Leece, Christine Meaney, and Vivien Jones. 2006. Legends of the Dragon: Celebrating Asia's Historic Splendour. Hong Kong: PPP Co. ISBN 9789889889968. Bailey, Steven K. 2007. Strolling in Macaul a Visitor's Guide to Macau, Taipa, and Coloane. Thingasian. ISBN 9780971594098. Cheng, Christina Miu Bing. 1999. Macau: A Cultural Janus. Hong Kong: Hong Kong University. ISBN 9789622094864. Guillen-Nuñez, Cesar, and Ka Tai Leong. 1999. Macao Streets. Hong Kong: Oxford University Press. ISBN 9780195877663. Pons, Philippe, and Sarah Adams. 2002. Macao. Topographics. London: Reaktion. ISBN 9781861891365. Ride, Lindsay, May Ride, and Bernard Mellor. 1996. An East India Company Cemetery: Protestant Burials in Macao. Hong Kong: Hong Kong University Press. ISBN 9789622093843. Ride, Lindsay, May Ride, and Jason Wordie. 1999. The Voices of Macao Stones. Hong Kong: Hong Kong University Press. ISBN 9789622094871. Information about the Morrison Chapel. History of "Historic Center of Macau"
This page was last modified on 9 January 2018, at 16:04.